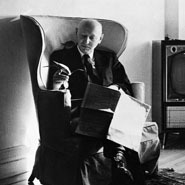 Born in Poland, Isaac Bashevis Singer left rabbinical school to write for a Yiddish literary magazine and, after his move to New York in 1935, for the Jewish Daily Forward. Singer went on to become a leading figure of the Yiddish literary movement. His first major work, The Family Moskat (1950), depicted an early 20th-century Polish Jewish family. His popular short stories included the famous "Gimpel the Fool." Probing issues of personal morality, his novel Enemies: A Love Story (1972) depicted a Holocaust survivor struggling with his desires, family, and faith. Singer won the Nobel Prize in Literature in 1978.